Women and cars... Cars and women... Without the two life doesn't make much sense, does it? And yet, they often don't blend that well together. Having this in mind I decided to, from time to time, draw attention to some of the models tailored for our better halves, thus not excluding them from this auto-maniacal story of ours. I feel that, with some right choices, such vehicles could become a natural extension of every modern member of my favorite gender (out of 3 offered on Facebook registration page). Many of the women pointed out Fiat 500 as their dream car. Small in size, "cute", simple and practical, it fulfills most of their needs and requirements. That's exactly the reason I decided to introduce them to something closest to it, maybe a bit less eye-catching, but few bits less expensive. Just a glance at this car and it instantly becomes clear that Fiat 500 and Ford Fiesta were more than just friends, if you know what I mean. I can't judge them though, the two models made fantastic results with the female audience, hence the little Ka logical epilogue. 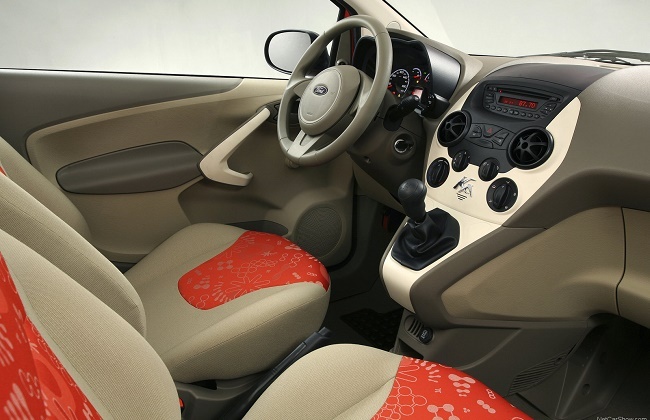 And while body and interior are pure Ford, complete DNA under its skin is FIAT's, especially engines. I chose to highlight the most popular 1.2 FIRE power-train, not too thirsty for petrol, and just powerful enough to handle everyday city routes. Simply designed and freed of complicated components, this engine should spare you from frequent afternoon visits to a local garage full of middle-aged, engine oil sprayed, hungry for money mechanics. Exactly the same engine is powering the latest "cinquecento" and it's not unusual that FIAT garages, found in almost every town, are maintaining little Fords, without any problems. Situation doesn't change even if you opt for diesel, because the TDCi badge is actually hiding a famous 1.3 MultiJet of the Italian manufacturer. Another aspect of the FIAT's heritage is the emphasized individuality they've striven for during the production, as seen through number of offered colors and body stripes / patterns, as well as different cloth patterns of the interior. 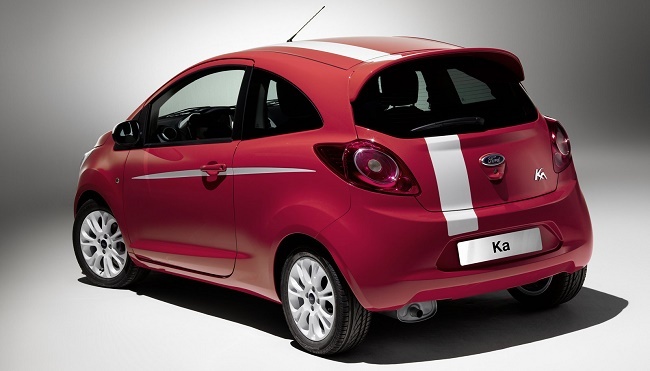 Ford did its best to ensure that two exactly same Ka will never meet on the street, so it would be even easier for you to bind to your exact specimen. Moreover, you still remember that party when she arrived in the same dress as you, and that's not something you'd like to live through once more, not even for few moments on the traffic light. Commands are simple and clearly arranged, visibility is on the good side, mostly thanks to the seats positioned a little bit higher than usual. Considering it's an A-segment car we're discussing here, we shouldn't be surprised that steering wheel dept adjustment is not available. This shouldn't present much of a problem though as girls tend to drag seat towards the wheel and not vice versa. To sum up, my ladies, if you're looking for a car which will take you wherever your modern lifestyle requires you to go, which you could park easily and even more easily find it by its color in the parking afterwards, all this without any stress - little Ka could be the right choice for you. It offers just enough space on the back seat for your bags from H&M and C&A. You can leave your purse on the passenger seat because your little white Maltese dog is in your lap always, even when you drive. The boot will easily take 6 shoe boxes, and my reliable source says you never buy more than 6 pairs of shoes. At least not during the same day. And now that I used out all the clichés, I'd just like to mention that all this doesn't mean men can't drive this car. It does ensure, though, the ridicule from my, and other size-burdened people's side. Unless they park it between two jardinières on a crowded street. Then we get jealous. 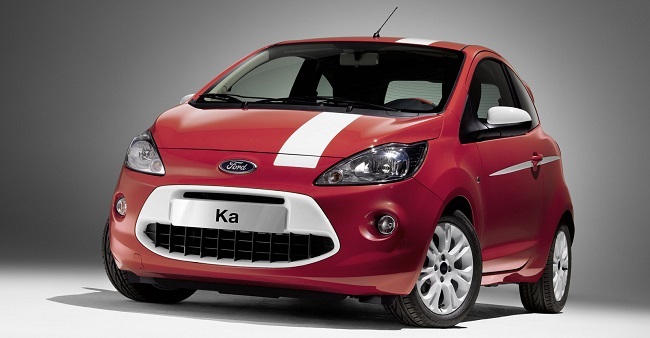 At the end, everything taken into count, we could freely say that Ford Ka brought the expression "size doesn't matter", to a completely new level.